Home » Actors/Actresses » Comedy » The boys from the 'Small Rouge One' are back for series XI! The boys from the 'Small Rouge One' are back for series XI! 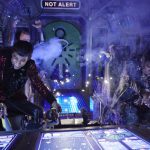 While there hasn’t been confirmation of this as of yet on reddwarf.co.uk, it’s worth putting this out there because news is traveling fast around the Internets…and everything you read on the Internets is true, right? 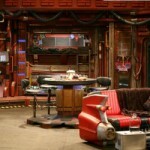 Almost three years to the day since Dave’s announcement that there was to be a Red Dwarf X in our collective future comes official ‘unofficial’ word from What Culture that the boys from the ‘small rouge one’, as Robert Llewellyn affectionately calls Red Dwarf on his popular Llewblog, are coming back. Yes, Virginia, there is a Santa Claus. 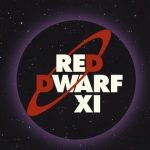 Red Dwarf XI was confirmed this past week during a Red Dwarf panel by none other than Chris Barrie (Rimmer), Danny John-Jules (Cat) and Robert Llewellyn (Kryten) at the Sci-Fi Scarborough convention. According to Philip Frazier over at What Culture, it was John-Jules who let ‘the cat out of the bag’ back in January when he tweeted that a new series of the science-fiction comedy classic was being written by co-creator, Doug Naylor, and who also confirmed that shooting is scheduled to get under-way in October 2014 with the series an eye on Autumn 2015 for a possible transmission on Dave, the home of witty banter. The Boys are Back! RDXI begins 22 Smegtember on Dave! 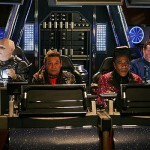 Red Dwarf XI – The Boys are Back…hopefully in 2014!